Government and Corporate offices need to protect their critical assets and augment their security and this is possible with the help of a device featured in the Datacard SP75 Printer review. This is a powerful printer that combines state-of-the-art security and reliability, making it suitable for high-risk environments. Just the same, it delivers high speed performance and exceptional quality of prints which institutions such as universities can depend on. Its applications include employee cards, membership cards and access control. Datacard SP75 comes with supplies that are easy to change. Its quick change ribbons are simple to load. Laminates and topcoat come in easy to replace cartridges. It provides security not only for the cards it prints but also for itself. You can optimize security by means of the brand’s exclusive Duraguard laminates. These provide edge to edge protection against tampering, forgery and damage. It has an assortment of laminates for CR80 cards and each offers its own distinct advantage. Datacard® DuraGard® clear laminates give cards a longer life by protecting them from moisture, scratches and chemical reactions. Secure print laminates come with a sturdy topcoat and personalized text plus a holographic image that offers cost-efficient security. Holographic laminates blend custom-made artwork with durability that makes it virtually tamper-proof. Anyone attempting to alter will have to destroy the card. Optigram laminates have the most features, having numerous optical variable devices such as Securetext™ micro-printing, holograms, guilloche patterns and laser retrievable concealed text. This printer comes with a hardware lock suite that prevents theft by securing supplies that are being used, blank stock of cards and rejected cards, inside the printer. By means of a Kensington® lock, you can secure it to a desk. You can, likewise, match it to a host PC so it won’t operate unless it is connected. It is designed with less moving parts. It has a high duty cycle that enables it to provide a reliable performance and excellent productivity. It is versatile in its ability to laminate cards produced by another printer. It is capable of using the same type of laminate to 2 sides of a card or different types of laminate to each side of a card. It can hand out smart cards (contact and contactless), proximity cards (HID® and iCLASS to control access) and ID cards that include barcodes and magnetic stripes. The printer’s capabilities include single or dual sided printing; edge-to-edge printing; black and white photo printing; printing in full color; printing in continuous tone; printing of alphanumeric text, logos, digital signatures, bar codes and background patterns. It is capable of fluorescent printing which makes use of fluorescent text that can only be seen under UV light. It is easy to verify the authenticity of the card. It, also, prevents forgery. It comes standard with USB and Ethernet connectivity that enables you to print as you plug into a computer. You can, immediately, give out cards. It is compact with its small footprint of 23.1" L x 9.92" W x 18.82" H for an input hopper with a 100 card capacity and 23.1" L x 9.92" W x 23.52” H for an input hopper with a 200 card capacity. It weighs less than 27 lbs. It prints at a fast speed of 175 cards per hour and prints with a resolution of 300 x 300 dpi, with a shade count of 256. 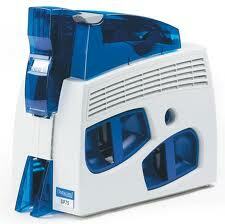 It supports PVC cards with a glossy laminate surface and materials with PVC overlaminates (optional). It can handle cards with a size of 3.37” x 2.13”. It can hold cards of varied media thickness such as 0.020” to 0.050 “for printing only; 0.030”to 0.050” for printing and laminating; 0.020” to 0.040” for cards with magnetic stripe that are not laminated; 0.030” to 0.040” for cards with magnetic stripe that are laminated; 0.030” to 0.040” for cards with smart card chip (contact); 0.030” to 0.050” for cards with smart card chip (non-contact). High risk environments such as government and corporate offices can rely on Datacard SP75 to give them the security they need. It offers high security features that include varied laminates to protect cards from counterfeit, alteration and damage. It has remarkable fluorescent printing that allows the card to be, easily, authenticated under UV light. The printer, in itself, is well protected. Its active supplies together with blank cards and rejected cards are kept inside the printer while the device can be secured to your desk by means of a Kensington® lock. Furthermore, matching it to a host PC prevents it from being operational when disconnected. This printer, also, prints, fast, and produces high quality output that, also, makes it ideal for institutions such as universities and colleges. It is easy to operate with its quick to change supplies. It is, therefore, simple to maintain. It has several printing capabilities such as mono and full color printing, photo printing, single sided printing, dual sided printing, edge to edge printing and printing of security features like a bar code and digital signature. It has flexible card handling, being able to support a wide range of media thickness. It is, also, versatile in its ability to laminate cards from another printer and to use different types of laminates on two sides of the same card. It is a highly productive printer with its duty cycle. With USB and Ethernet connectivity, you can issue cards anytime you want to, the moment you plug it into a PC. Like all other devices under the Datacard SP range, it is designed to be highly reliable. It is no wonder why the brand is considered as the best selling secure ID card solution and SP75 is a convincing example. With its reliability in printing and its advanced security features, this printer will, surely, not fail to impress. A lot of organizations will benefit from this printing device and this has been stressed in this Datacard SP75 Printer review. Simply click here to return to Best Printers 2011.